Marc Antony (83-30 B.C.) - Marcus Antonius. A Roman general under Julius Caesar and member of the Second Triumvirate. Little is known about his childhood, but he was related to Julius Caesar through his mother. As a result, he served in Caesar's army and began to distinguish himself as an officer during the Gallic Wars. However, he was in Rome serving as Tribune of the Plebians when Caesar crossed the Rubicon. When he learned Caesar was marching on Rome, he left the city and joined his commander and friend. Antony played a pivotal role in the Battle of Pharsalus by crossing the Adriatic Sea with half of Caesar's troops in order to augment his army in 48 B.C. (see Battle of Pharsalus). After Caesar's assassination, he and Octavian became allies, aligning against the senate. Unlike the First Triumvirate, which was largely a figurehead, the second was recognized as a legitimate political entity with real power; assembled in 43 B.C. primarily to hunt down the assassins of Julius Caesar. And of the triumvirate, Antony and Octavian were the real power players. Lepidus, the third member was essentially there just to round out the field. A year later, the triumvirs were successful in defeating the masterminds of Caesar's assassination, Brutus and Cassius, at the Battle of Philippi. This was a period of transition for Rome. While technically still a republic, senatorial power was breaking down, and it was at best a quasi-republic. This was evident by the triumvirate's success at getting several members of the senate and their allies declared enemies of the state. Cicero was one of these and he was assassinated by Antony's men in 43. However, the ambitions of Antony and Octavian would cause the triumvirate to eventually fall apart as well. In the interim, the two had to back their ambitions with power. This was easier for Octavian who was Caesar's heir, and therefore, viewed as his legitimate successor. Antony, on the other hand, traveled east and formed an alliance with Egypt's queen, Cleopatra. One little known historical fact is that the Parthian Empire supported the conspirators who assassinated Caesar by sending troops to help at the Battle of Philippi. No doubt the Parthians were aware of the rumors of a possible Roman invasion of their kingdom. Shortly after, they also invaded Syria, which had been conquered by Pompey two decades earlier, and occupied it. One of their next moves was to replace King Hyrcanus (who was pro-Roman) of the semi-independent kingdom of Judea with Antigonus. 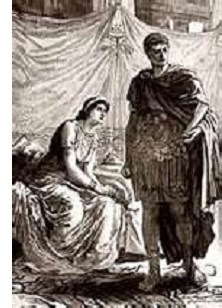 Now Antony made plans to punish Parthia for interfering in Roman affairs. This would expand his power and increase his standing in Rome. In 40 B.C., the Second Triumvirate was still in place and Octavian supported Antony with the promise to send an army. However, back in Italy, Octavian was dealing with a rebellion by Sextus Pompeius (son of Pompey the Great) and Antony's army never materialized. This played a significant role in deteriorating relations between the two. Antony made the decision not to wait for Octavian's help. His alliance with Cleopatra put Egypt's resources at his disposal. In 37 B.C. he deposed Antigonus of Judea and installed the infamous Herod the Great (the man who reigned when Jesus Christ was born in Bethlehem). Then he invaded Parthia with an army of about 100,000 men. Unfortunately for him, things did not go well. He was repelled and forced to retreat. The march back to Egypt proved more costly than the campaign itself, and Antony lost a quarter of his army. Even more costly were the events transpiring back in Rome. Octavian had booted Lepidus from the triumvirate and the triple alliance was no more. Octavian now had almost total control in Rome. He turned public opinion against Antony by accusing him of forsaking Rome and adopting Egypt as his new home. He persuaded the senate to declare war on Egypt, but not Antony specifically, in an attempt not to alienate the allies Antony still had. What followed was yet another civil war (the third of the century). But this one stretched across the Mediterranean from Italy all the way to Egypt. The war culminated in 31 B.C. with the Battle of Actium and the defeat of Antony and Cleopatra. The two committed suicide shortly thereafter. Octavian became Augustus and the first official emperor of Rome.